With eggplants you’ll need to let them release their liquids, they’re kinda bloated tee hee! Slice them early and place them into your colander so they’ll be ready when you are. You can even make this dish up ahead of time & just pull it out & bake it right before dinner. On the cheese measurements, they are estimates (I usually just go by look). GASP! Don’t freak out. Just remember that your layers need to be equal. You don’t want your dish to be top heavy or bottom heavy now would you? If you use a little more cheese, or less cheese, no worries! Here’s a secret: Recipes are just suggestions really ; ) Do what you like! You might surprise yourself with what you come up with! After slicing your egglant, place the slices into a colander & sprinkle with salt. Place a large stock pot filled with water ontop of eggplant to help it to release it’s liquids. Allow eggplant to drain for 30 mins – 1 hour. WHILE eggplant is draining, into large saucepan add your tomatoes & 1/2 of your chopped basil. Season with s/p & allow to cook over medium-high heat for approx 30 mins. Stirring as necessary. When finished cooking, put the sauce mixture into your food processor, blender or foodmill until it has a beautiful silky sauce consistency. Place enough oil (1/4 cup ish) into a pan & heat over med heat. Pat your eggplant slices dry & fry them until golden. Do not crowd the pan, do this in batches. When golden, transfer them to a plate lined with paper towels. Continue until all slices are fried. Set them aside. Preaheat your oven to 350 degrees. To assemble: Spray a large ovenproof dish with cooking spray. Place a ladel full of sauce onto bottom. Place a layer of eggplant on the bottom. 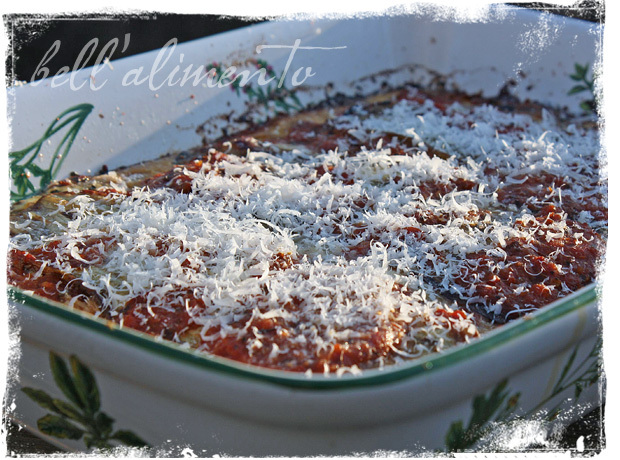 Sprinkle with Parmigiano Reggiano & Mozzarella slices & a sprinkling of some chopped basil. Add a few (2-3) tbsp of beaten eggs. Continue with same pattern until all layers are complete. Top layer should ONLY have eggplant & tomato sauce. Cut the butter into small pieces & randomly place on top. Bake for 30-40 mins or until golden & bubbly. Garnish with Parmigiano Reggiano! Allow to cool for a few mins before cutting so that your slices remain intact! Yum… This has me craving eggplant again… I haven’t made any in a while. Will definitely give your recipe a try. Being Italian – I think I’ve had 100’s of versions of eggplant parm, I’ve never seen beaten egg added to the layering —- does this give it the effect of being breaded without being breaded?? Can’t wait to try this method! Just gorgeous!! I have GOT to try this!! Oh, YUM. Eggplant parmesan is one of my favorite dishes. I’m also intrigued by your method here. Do let us know about the eggs! I adore eggplant parmesan, but most nightshade vegetables and I don’t get along — my mouth goes into a bit of a rage when I eat them. I’ve discovered that I can put eggplant parmesan on a crispy, toasted sub roll and the bread (and an extra slice of cheese) helps neutralize the reaction. I know this sounds inelegant, but such is my devotion to eggplant parmesan! And now it’s my favorite sandwich too. A great way to prepare eggplants. They are actually one of my favorite Springtime vegetables and I can’t wait to see their shiny, purple skins again. I’ve always been intimidated by eggplants. But, this looks to good to not make! Eggplant parm is my mother’s favorite recipe, so I always try to find ways to make it even better as a surprise. I’ve never seen it made without breading the eggplant in a flour, egg, bread crumb mixture. Why do you fry without breading and use the beaten egg within the layers? Whenever I make it the eggplants seem to get soggy (probably because I don’t work to get the water out of them as you recommended), but am wondering if that would help too. Thanks! I always end up making lasagne even though I love eggplant so thanks for the kick in the pants! OMG! I LURVE Eggplant TOO! I could eat it every week and I try to find some way to do JUST THAT! …..pretty successfully I might add. 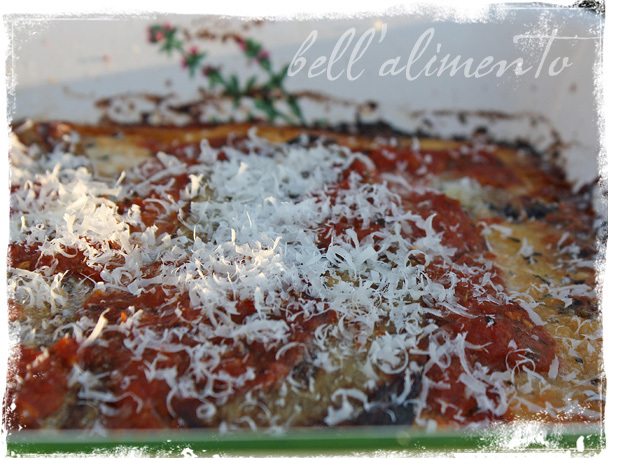 One of my all time favs is Eggplant Parm and I make mine almost like your recipe. I don’t digg on the breaded kind (in my Parm, now pile a plate up with Fried Eggplant with a little lemon.. oh heck yeah!). I’ve never drizzled egg on mine before either, I’ll give it a try. Love ur site! Ciao!